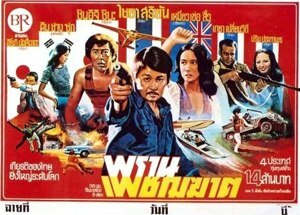 Some action Thai movies (หนังบู๊) take place in Thai Chinese community. 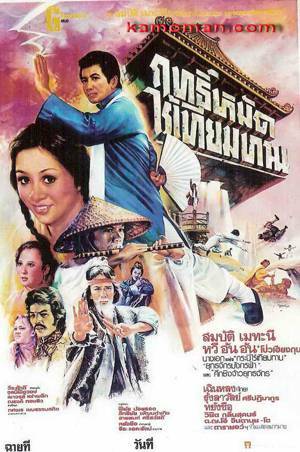 Thai Chinese movie อัศวินดาบกายสิทธิ์ - 飛俠神刀 - "Flyer and Magic Sword" lasts 1h20mn and was released in year 1970. It was released under 35mm, VHS, VCD and DVD format. It was shot in Hong Kong. It was the first international movie in which Mitr Chaibancha took part. 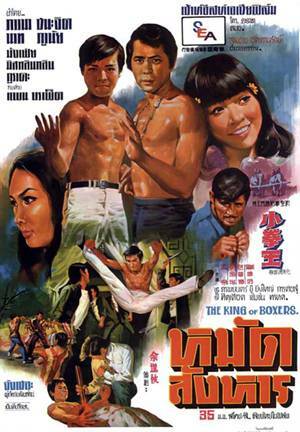 Two versions of the movie were shot, one with Hong Kong Chinese star (กว่าง หลิน / Ling Fan) as the leading actress for the international version and one with Petchara Chaowarat as leading actress for the Thai version. 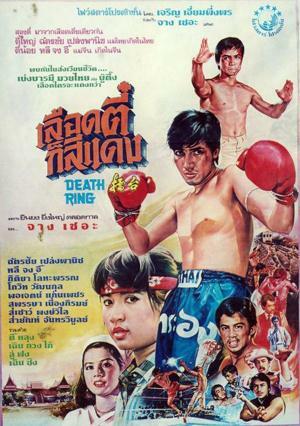 As Mitr Chaibancha died in an accident in 1970, an actor from Chaiyaphum province called Chat Chaiyaphum (ชาติ ชัยภูมิ) was used in order to finish the movie. 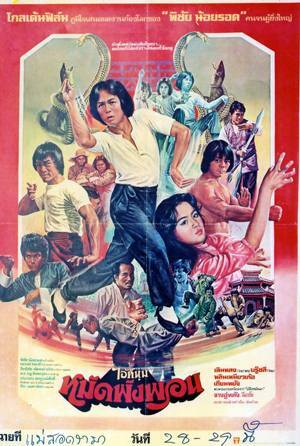 Mitr also started playing in another Chinese movie จอมดาบพิชัยยุทธ (1971) but was replaced by another actor called Luechai Natnat (ลือชัย นฤนาท). 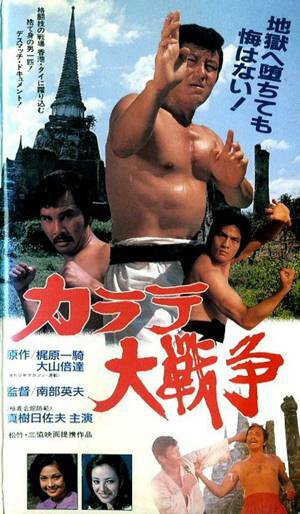 The movie includes flying acrobatic fights shot in Hong Kong's Sai Kung country park. The DVD/VCD includes the Hong Kong version featuring Ling Fan as main actress. 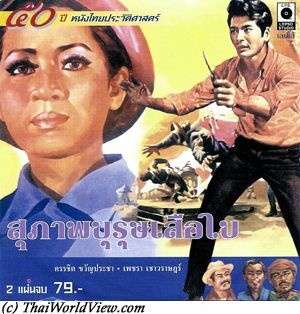 The DVD/VCD also includes 52 minutes of old damaged footage with Thai actress Petchara Chaowarat playing Lan Choo. 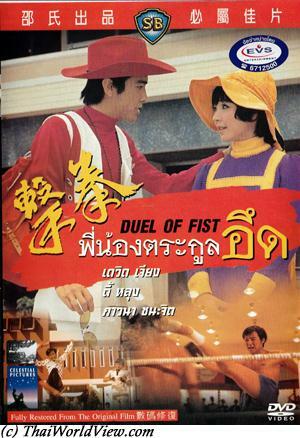 This movie is also known under the name "อภินิหารดาบทองคำ" or “Hooded Swordsman”. Lan Choo, her father and his guards are attacked in their home by a group of armed men led by another clan. 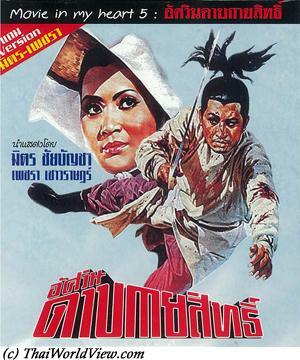 Wai Ching (Mitr Chaibancha) saves Lan Choo (คู่รัก). She leaves upset as Wai Ching is still angry against her father. She then meets a mysterious man expert in blade, Phi Lun, who declares his love to her. The two clans are fighting over a salt mine. Lan Choo's father stole the salt mine from Wai Ching's father. He has issues with Phi Lun, the mysterious expert in blade, so the two clans decide to support each other. Lan Choo's father expects help from Wai Ching by promising a wedding with his daughter but Wai Ching refuses as he cannot forget the past. Lan Choo's father killed Wai Ching's father. Phi Lun is half crazy and a rivality emerges with Wai Ching as they both love Lan Choo. Phi Lun has become crazy (คนบ้าฆ่าคน) as his mother was raped and killed in front of him. Phi Lun kills people that Wai Ching loves. So Wai Ching chases Phi Lun for a fight. Wai Ching has special skills such as flying jumps. Phi Lun is using small blades behaving like boomerang. Wai Ching is defeated but Phi Lun spares his life this time. Wai Ching uses a stratagem to defeat Phi Lun through a revenge fight. Phi Lun is left as dead. Then the two clans make alliance against Wai Ching. Wai Ching is welcomed by the father, who organises a big feast. This is a trap and Wai Ching is captured. Phi Lun, who didn't die yet, helps Wai Ching to escape. Phi Lun helps as he wishes to kill Wai Ching by himself. Finally Wai Ching defeats Phi Lun again. Seeing Wai Ching being weaker due to the fighting with Phi Lun, the father is about to kill him but Phi Lun saves his life for a last time. Wai Ching flees thanks to Lan Choo and the two clans kill each other to get the salt mine. 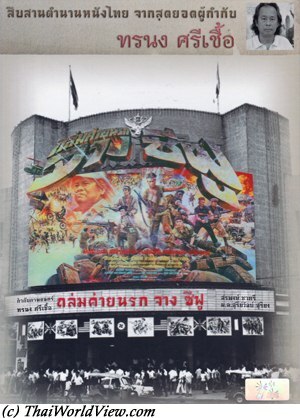 In year 1992, there was discussion to project the Thai version in Ambassador theater (แอมบาสเดอร์). It didn't happen as the film was incomplete. Finally อัศวินดาบกายสิทธิ์ movie was released a second time in year 1998. 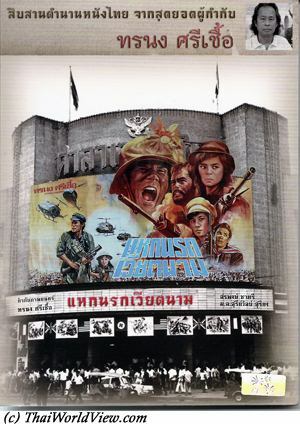 It was released in theater by movie director Khun To Pantamit as an homage for Mitr Chaibancha birthday. Khun To Pantamit ordered a new copy of the 35mm film from Hong Kong and had it dubbed in Thai language. Thanks to his later release, the movie is still available in HD colorful version. If it was the original 1970 film, the 35mm film would be red already and damaged similar to the Thai release. It was shown in theater เฉลิมกรุง 20 times. It was also released nationwide in Thailand. Devilish killer can defeat 15 men in a single combat thanks to his iron hands, strong kick and powerful nine ring golden blade. He requests a thunderbolt sword to a clan leader. The clan leader refuses as it is the Clan sacred sword. He sends his two sons Chi Wen (Chaiya Suriyun) and Chi Wu away with the sword. The devilish killer defeats the clan leader and its men. He is now looking after Chi Wen and Chi Wu. Chi Wen is also defeated but the godly beggar helps him to escape death and to flee. Chi Wu is also defeated but gets help from a mysterious blind fighter. Chi Wen is taught by the godly beggar how to better fight. 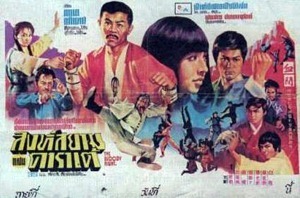 He helps princess Ju Yen (Petchara Chaowarat) attacked by two ruffians. Love emerges between both of them. Her father has promised her to devilish killer. Aware of Chi Wen, the father makes him pass difficult but successful tests. He finally drugs him, disfigured him and throws him from a cliff. Chi Wen refuses to see Ju Yen again as he feels ashamed to be disfigured. Meanwhile Chi Wu meets a young lady miss Chow selling flowers in a temple. She is skilled in sword handling. Following altercation with ruffians, Chi Wu is about to be defeated by them but finally secured by his own masked brother. Chi Wen refuses to disclose his identity and trains Chi Wu to improve his skills. This time it is Chi Wu helping miss Chow in a fight against ruffians. Ju Yen also joins us as she hopes to get news of Chi Wen from Chi Wu. Chi Wu notices miss Chow has the same sword. Only twin thunderbolt blades can defeat devilish killer. Chi Wen takes the two swords in order to train himself. Chi Wu, miss Chow and Ju Yen defy the devilish killer. Will Chi Wen join them on time? They are finally defeated despite using tricks such as armor or water to extinguish fire bombs. Chi Wen arrives on time to defeat the devilish killer thanks to the twin thunderbolt blades. They are finally all safe and Chi Wen's face is restored thanks to his master. 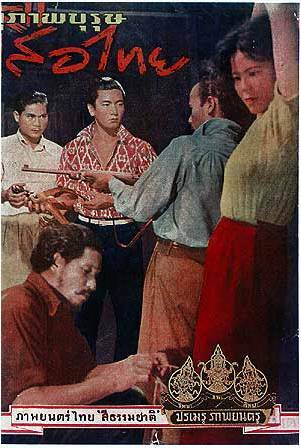 This Taiwanese movie 活閻王 was supposed to feature Thai famous actor Mitr Chaibancha but following his sudden death in 1970, he was finally replaced by Chaiya Suriyun. Mitr Chaibancha went to Hong Kong to play in three Wuxia films in his last year. But only "Flyer and Magic Sword" was completed. "Sword of Emei", "The Tiger and the Dragon" and “The Devilish Killer” were finished with other leading actor. This movie is also called " L'uomo della grande muraglia" overseas. 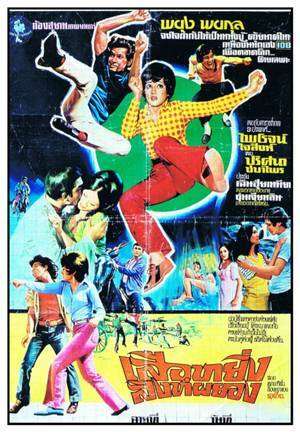 Thai movie พรานเพชฌฆาต (TOKYO-SEOUL-BANGKOK - 東京-ソウル-バンコック_実録 麻薬地帯) was released in year 1973. It lasts 1h42mn. This co production movie is lost in Thailand but still available in Japan. As the movie is in Japanese language only, below summary might not be fully correct. Two cars are chasing and the lady's car is pushed in a ravine. She was Sonny Chiba's girlfriend. In the remainings of the car, a camera is found. It contains a picture of the girlfriend and another younger Korean lady. Ruffians are following Sonny and beat him seriously. He gets help from a detective. The ruffians become the ones chased but their leader succeeds to escape. 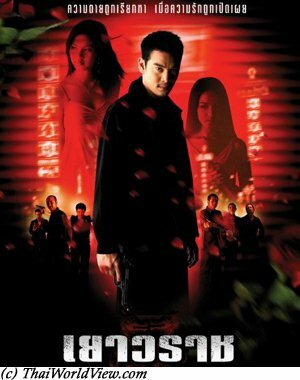 The movie continues to Hong Kong where the leader does his drug trafficking. The action ends up in Thailand. Pipop Pupinyo is the right hand of the Japanese ruffian in Thailand. Chosri Misommon is playing a domestic helper. The ruffian leader's girlfriend sees Sonny in a market. Sonny meets Chaiya Suriyun but this latter dislikes Japanese people. Finally Chaiya helps Sony when he is overwhelmed by thugs sent by Pipop Pupinyo. Ruffians leader wishes to buy heroin and gets introduced to Kecha Plianvithee by Pipop. Heroin shall be available in north of Thailand. Chase is happening between Sony and the ruffians leader. Kecha through a small airplane tries to kill all of them. Chaiya is also involved in the shootings. The girlfriend is shot. The ruffians leader is killed but Kecha gets also killed. Before dying the Japanese ruffians leader gives important information about the gang location in Japan. 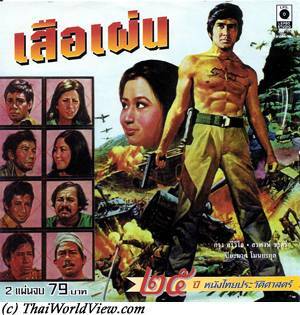 Sony accepts to bring Chaiya to Thailand and they destroy their secret laboratory and the leader dies. The Thai poster mentions 4 countries for a budget of 14M Baht. 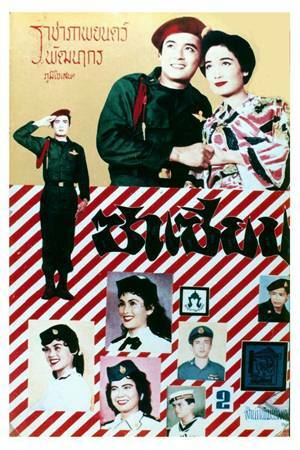 Chaiya Suriyun is put in the centre of the poster despite not being the main actor of the movie. 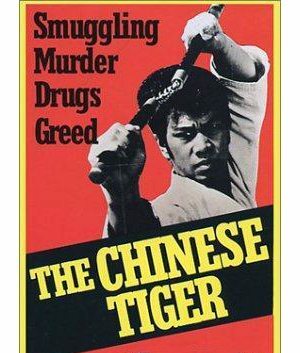 Thai Hong Kong ไอ้เสือตี๋ / "The Chinese Tiger" / 唐山猛虎 movie was released in year 1974. It lasts 1h30mn. Chinese citizen manage a company providing goods shipment from Thailand to Hong Kong. An employee is killed. Ruffians take advantage to hide drugs among the cereals. Goods are shipped to Hong Kong. 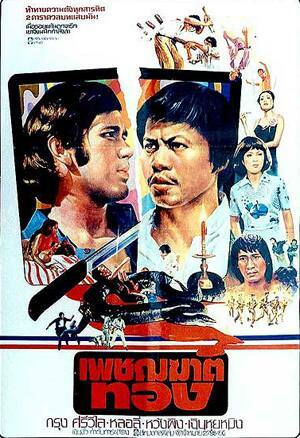 Pan Borapet is hired to kill Limin (Larry Lee) in order to stop investigation but he fails. Limin’s brother as courier is arrested by Hong Kong police as drug was discovered. Mr Choi is behind this. Limin decides to go to Hong Kong to investigate. Young lady Fefei (Louise Lee Si-Kei) is used as drug mule by the gang. Ruffians try to stop Limin but his Kung Fu skills are too good for the ruffians. Limin identifies that drugs exchange is happening in a high class restaurant through Fefei. Limin joins the transporters and assist to a fighting between the big boss and two ruffians trying to take over their business. Limin is the troublemaker from Thailand! Limin defeats the big boss and his brother is released. Fefei has to go to jail. She promises to visit Limin in Thailand when she has purged her sentence. Back to Thailand, Limin has to fight against the ruffians, who hid the drugs inside his company goods. This movie takes place in the 1940s in the Thai Chinese communauty. Two Chinese secret societies are confronting each other. This violent and bloody movie is a Taiwanese-Thai cinematographic cooperation. Bangkok Yaowarat district has so far been protected by mafia godfather Tong, with the assistance of Saleng as his right-hand man. Meanwhile, the Pahurat area is controlled by another gangster, Dada, and his close partner, Kaolad. The coexistence of the rival territories is shattered when Saleng and Kaolad challenge each other. 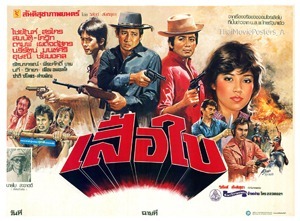 Some action Thai movies (หนังบู๊) deal about outlaws in 1940s and 1960s. 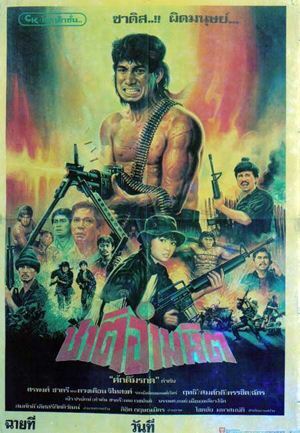 Dang Bireley and the Young Gangsters (2499 อันธพาลครองเมือง) is a Thai movie released in year 1997 and directed by Nonzee Nimitbut. Daeng is the son of prostitute and has been in violence cycles since his young age. The action takes place in decade 1950s with youth references such as Elvis Presley or James Dean. Daeng always kiss his James Dean amulet to get good luck and not a Buddhist amulet. Daeng, Pu, Dam, Lem Sing, Piek are close friends (นักเรียน / นักเลง). Daeng's mother would like her son to ordain (บวช). Daeng would like his mum to stop such job. He meets Pra, a bar singer. He refuses to do normal job and keeps trying in order to become a ruffians leader in his district but other leaders are already present so it causes clashes. Daeng gets a gun to get revenge. 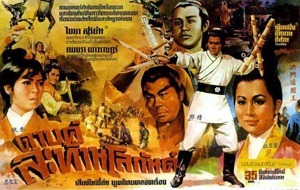 During an outdoor movie performance in a temple fair with an old movie featuring Sor Asanajinda, Taksin Jampol and Wilaiwan Watthanaphanit, Daeng shots rival thug. Issues then happen with Dam and Pu. Piek ends up in jail. Friendship ends with Dam and Pu. Daeng cannot choose his path but can fight it. Daeng helps his friend Moo Chiem to protect the blue moon bar in Chonburi. Moo Chiem wishes to open a casino (บอล) but he is then in competition with local headman Taek. Moo Chiem hires Pu and Dam without telling Daeng. Pu and Dam have arguments with GIs causing the casino to be closed ten days. Moo Chiem is killed by a hitman. Taek is suspected. Taek hires Pu and Dam to destroy the underground casino. Daeng and his team takes revenge over Taek but Pu and Dam succeed to escape. Daeng goes back home to fulfill his promise to ordain to his mother. Despite threats to ruin the ceremony by Pu and Dam, Daeng decides to go ahead. During the ceremony, heavy shootings happen. Daeng, Pu, Laem and Dam die. Daeng’s promise to ordain as a monk was only to please his mother. His heart was not really sincere so he ironically dies before being able to enter the Buddhist temple. Another movie in 2012 called Gangster - Antapal (อันธพาล) was released and involving same protagonists. It was not a remake but another view on the same gangster era. 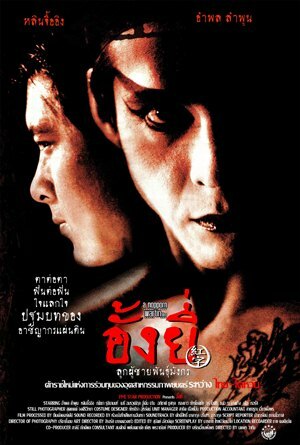 This movie has taken over 75 million baht at the box office in 1997, an amazing figure by local standards. This movie takes place in the 1960s featuring nice rock songs and costumes. It features a love story through the confrontation between two gangs. 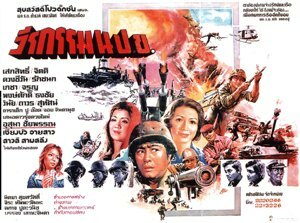 Some action Thai movies (หนังบู๊) are war movies. 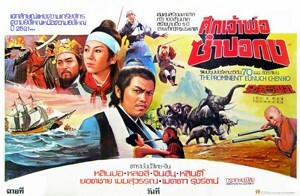 In Thai langague, such movies are called หนังสงคราม. A former soldier thinks about his daughter, who is very sick. 100 000 baht are needed to cure her. A mercenary job is offered to him for 500 000 baht. He has 4 days to do the job. On the field in Laos, he is leading a team of 6 soldiers. They save a young lady, whose husband has been killed. She brings trouble inside the team as soldiers are fighting each other to seduce the lady. As she is indeed a spy, the leader killed her. Two soldiers die in traps in the jungle. They rescue a young lady held hostage in a village. They learn that their real mission is to capture a drug lord. But they are overwhelmed by the drug lord's tough men. They get tortured until the lady succeeds to rescue them on time. During the fight the drug lord, the soldiers and the lady are killed. The former soldier survives to see his daughter cured. 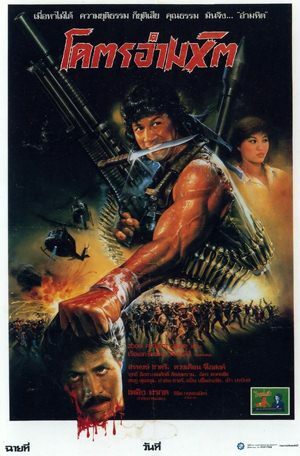 This movie is surfing on the Rambo II wave that started in 1985. The montage sequence is very bad. Abroad, this movie is also known as "Cannibal Mercenary". Once again, Leu (Bin Banleurit) is ordered by his boss to form a mercenary team to stop drug propagation in Thailand and get rid of a dangerous drug lord, called Bad dog, protected by scores of tough men. It could be a "The Magnificent Seven" Thai remake. Six former soldiers join. Leu is reluctant to form a new team as all members died in the previous mission. Every new team member has a reason to join, i.e. need 300 000 baht to cure a sick mother... They go inside the jungle. They are on unofficial mission so even the police and army can shoot them. They are mercenaries (คนรับจ้าง) so they are employed for die. During the progression in the jungle two mercenaries die (through machete and acid bath). On the way, they help lost migrants including one lady with a baby. During the final face to face with the drug lord, all his teammates die. Leu would like to exchange his life (แลกตาย) with them as he promised that no team members should die. 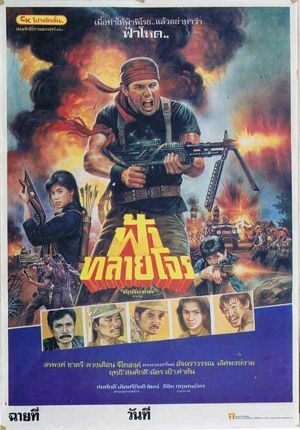 This is a typical 1980s Thai war movie with few interest. The action sequences are not credible enough. 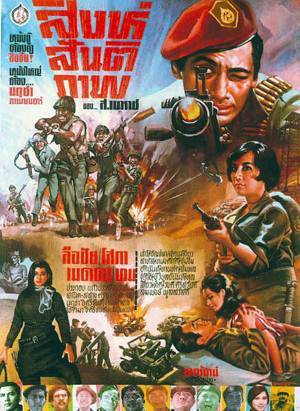 During the anti-communist years, movies with soldiers and mercenaries fighting in the jungle were popular. Most of these movies were low-profile, though some were popular as they played to the national sentiment. At the end of 1980s, when the communists were defeated, such action films faded. The movie lasts only 1h20mn. 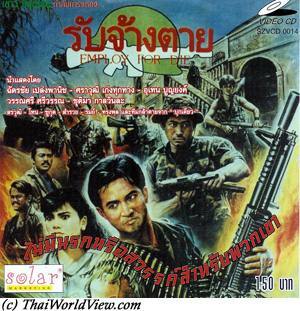 This Thai Action movie page 3 contains 40 records.